Verma Cosmetic and Family Dentistry offers an array of general and cosmetic dental services for patients in Mesquite, Texas and the surrounding Dallas areas. 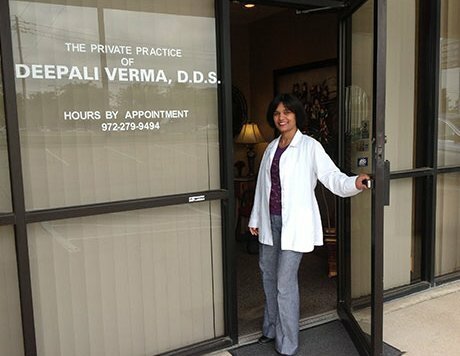 Under the direction of Dr. Deepali Verma, the offices provide cosmetic dentistry, restorative dentistry, preventative dentistry, and sedation dentistry. They also offer BOTOX for dentistry, implants, and Invisalign to make your smile look its best and brightest. Verma Cosmetic and Family Dentistry offers a holistic approach to dentistry, providing treatments and techniques designed to improve your overall well-being. The highly trained staff and Dr. Verma welcome you to a state-of the-art facility with a warm and inviting environment. Here, you are treated as a unique individual where dental services are provided with your specific needs in mind. The staff are there to answer any questions or concerns you have. After just a few visits you’ll get the smile you’ve always wanted. New patients are welcome. Some of the staff can assist many different dialects and nationalities. Most forms of insurance are accepted. Call or stop by today. We accept all traditional PPO insurance. Please call the office if you have any questions about your insurance.